It seems like a question with an easy answer: How many times have you broken your back? But when the person being questioned is 26-year-old Andrew Kurka of Palmer, the answer isn't automatic. He's broken his back too many times to remember. "Three times," Kurka said earlier this year. "Or four. No, four times. Sorry." Kurka heads into the Paralympics in Pyeongchang, South Korea, ranked first in the super-G and third in the downhill in the Para Alpine sit-ski world rankings. He competes in the downhill Saturday and the super-G Sunday in South Korea, and he is clear about his intentions. "Getting that gold medal for Alaska is really what I'm going for," Kurka said. 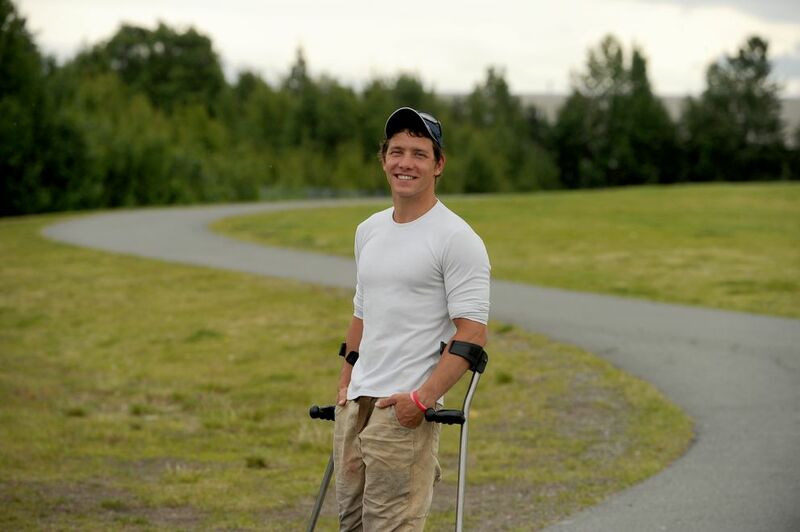 The first time Kurka broke his back, in 2005, was the time that changed his life. He was 13 years old when he flipped his 4-wheeler while riding at Jim Creek and suffered a spinal injury that paralyzed him below the waist. The injury required Kurka to learn how to walk with the help of leg braces, and it required him to adjust some goals. As a kid he dreamed about being an Olympic wrestler. After his injury, he learned how to mono-ski and the Paralympics replaced the Olympics in his dreams. The third time Kurka broke his back, in 2014, was the time that made him reassess his motto: "Life's short — live it fast." He was in Sochi, Russia, training for the downhill race in advance of his Paralympic debut in alpine skiing when he crashed. The injury knocked him out of the Games — he didn't even make it to the opening ceremonies — and sparked a fire that has driven him every day since. "From the moment I got hurt in Sochi, I started focusing on how I can be a better ski racer," Kurka said. Of course, Kurka being Kurka, sometimes the focus was all mental. Almost as soon as he recovered from his Sochi injury, he got hurt again — he broke his femur while training for the 2015 X Games. Three months later — and less than a month after returning to snow — Kurka captured the bronze medal in the super-G at the Para-Alpine World Championships in British Columbia. It was his first World Championship medal, and it taught him something important. "At that moment I realized my fast is a little faster than most people's," he said. "I started realizing, you know what? If I take it a little easier and start fine-tuning my technique and my line and still stay safe, I can still get the most speed out of each run." That was an enormous revelation for someone who had broken at least one bone in six consecutive seasons of racing, from 2010 to 2015. Going into the 2015-16 season, Kurka modified his motto. He was still all about skiing fast, but his recklessness was tempered somewhat by the newfound appreciation for technique and choosing swift but smart lines to ski. The 2016-17 season was Kurka's best ever, culminating in three medals at the World Championships in Tarvisio, Italy, — gold in the downhill, silver in the giant slalom, bronze in the super-G.
"I think he's doing a great job of skiing fast and skiing safe, which is something he didn't used to do," Kevin Jardine, the U.S. Paralympics alpine ski and snowboard high performance director, told teamusa.org. "He's grown up a little, which has helped him, and he's started to learn a little more about tactics and what it takes to win." As he heads into his races in Pyeongchang, Kurka is happy to say he's been injury-free since the broken thigh bone in 2015. "I've been on an extremely healthy streak," he said. "I've had little injuries, I've been sore, bruised up, but I haven't broken any serious bones since the femus. "I don't include the rib. That's not really a serious injury." Turns out Kurka won all of those medals at last year's World Championships with a broken rib he didn't know about. The week before the championships, Kurka got hurt during a slalom race in Slovenia but shook it off, even though he was in a lot of pain. "My physical therapist said 'You should probably get X-rays,' but there's not anything you can do about," Kurka said. So he went to Italy, won a bunch of medals and forgot about it. He remembered the ribs last month while having a routine check-up prior to the World Cup Finals in Kimberly, British Columbia. He was getting X-rays of his spine anyway, so he asked doctors to take a look at his ribs too. "We looked at it and it was broken," he said. "So I won a world championship with a broken rib." The tip of his longest rib turned sideways when it fractured, he said, and that's how it remains to this day. "Whenever I lay on my belly on a flat surface I can still feel it," he said. The rib probably should have been re-set in Slovenia but there's no need to worry about it, Kurka said with a nonchalance that is perhaps the product of his medical history. "Too late now," he said. "It healed."